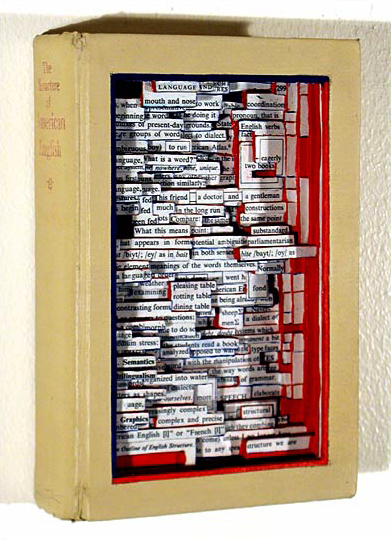 found object, linguistic carving, assemblage Brian Dettmer was recently invited to participate in an exhibition in Oakland, Ca. Titled: Banned and Recovered. 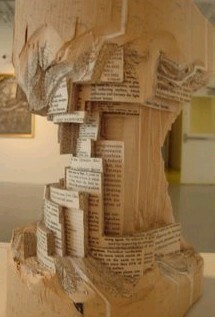 The exhibition gave artists creative liberty to deal with the actuality of banned books trough the abstraction of art. I’ve never really gotten the concept of banning a book nor, to be frank, the notion of defacing a book. A book is a book and particularly in this age of facsimile and instant reproduction banning the written word seems futile and defacing a book, well, rather than chopping a tree down or buying yet one more ream of bleached paper why not use a book as a note pad, ideation tool, or a wipe for your dirty bum. Klingons aside, clearly Mr. Dettmer’s work is original and inspired. The most beautiful aspect of the work besides its ingenious nature and perfect craftsmanship is the notion that a book is a living connected thing. To bring an image from page 346 in juxtaposition with images from page 216, 567, 732, and 435 exhibits a profound sense of connectedness and a perception on the part of the artist that drips connected thinking. 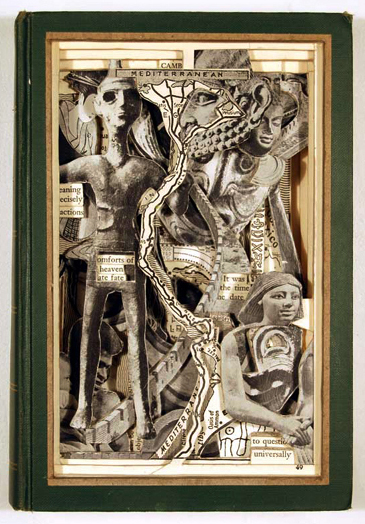 There is a world, a physical world, that exists inside every book and Mr. Dettmer seems to be able to bring that out (not only bring it out but make that the singular purpose of the book). What is it that seems so profound about these works? For one, the artist didn’t really create any thing, he removed quite a bit and revealed what was always in existence. The more I look at these works, the more profound they become to the process of Neemee and CultureWaves itself. Does CultureWaves, or Neemee for that matter, make anything? I would beg, no. The both of them are a process of reveling, a method of juxtaposing what already exists in life and bringing them together in the form of a narrative. In some cases an abstract narrative that scares those looking at it or hearing it. Mr.Dettmer has taken the Tractor from the T section of the dictionary, the Archimedes screwfrom the A section, the Xylophone from the X section, and the Stuart tank from the S section and juxtaposed them, through what must be a tedious process of removal, to tell just one of the many narratives that exist in what is essentially a catalog of what is commonly known. He is a Red Thread maker of exquisite caliber. We need to be that as well. Our value is not going to be in how many Titles we have in our library, Alexandria will forever remain the hero of that story, but rather our value is the exquisite nature of the stories we reveal, not Tell but Reveal. The mystery and majesty of what we do is reveal what is in plain sight, that is the aha moment. Many stories are being told every second, look at the explosion of the blogosphere, who can read them all. Where we are going to create real value is in a process of subtraction, cutting away the unnecessary and reveling the meaningful narrative or even the fantastical narrative. We need to elevate the trade to an art as Mr. Dettmer has, and make the meaning of that art relevant through a Meta-verse. he was so incited by herocious that he personally left a rather lengthy comment that, at times, sounds insulting. not sure whom you’ll agree with, dettmer or herocious, but i got a laugh out of it at least.